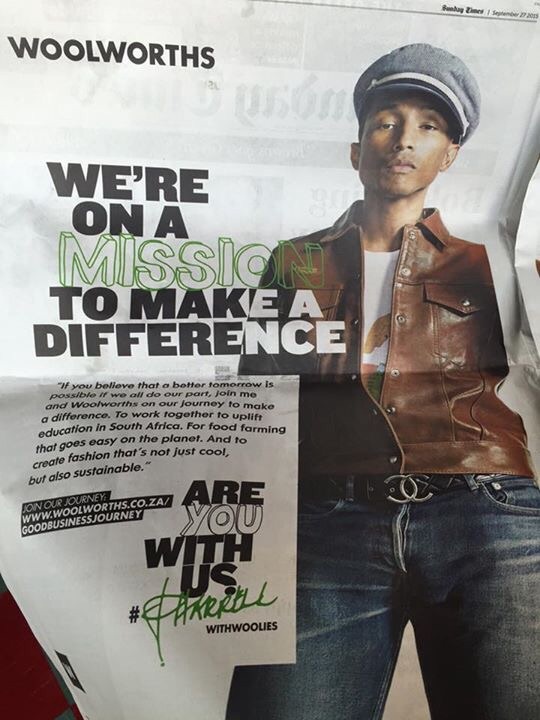 Having survived the demonstrations against the Pharrell Williams concert earlier this week, Woolworths aggressively took over the Sunday Times today, getting the newspaper to change its masthead and branding colour to green, with the placement of two double page spread advertisements, and getting a front page story out of it too! 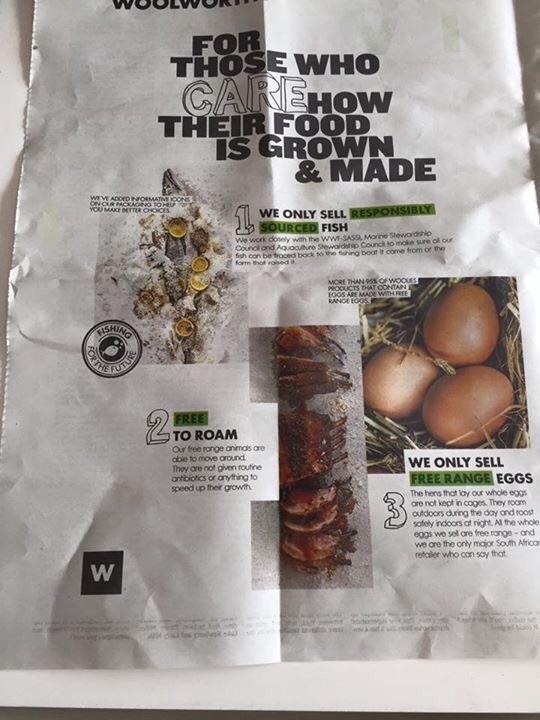 Woolworths shouts about its green and responsible approach to retailing in the advertisements. Each advertisement asks ‘Are you with us?‘, as its pay-off line, signed off with ‘#Pharrel withWoolies’. 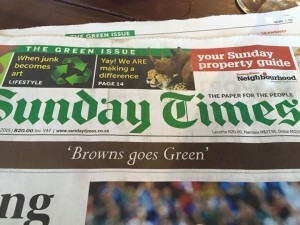 The front-page article stated that it is the first time in the history of the newspaper that it has changed its masthead colour from red to green, it being labelled the ‘The Green Issue‘. 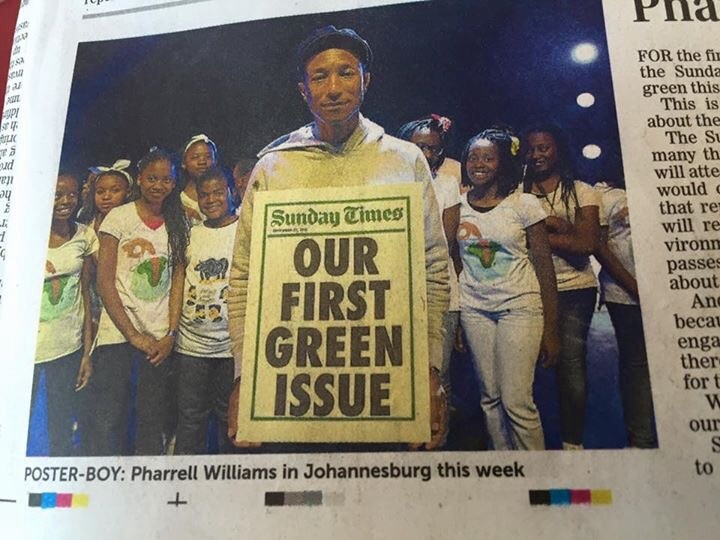 The newspaper brings Pharrell into the headline of the story (but not the retailer), starting with a spiel about how important the future of our planet is, and how serious the newspaper is about its future (not mentioning how many trees it takes to print the papers!)! 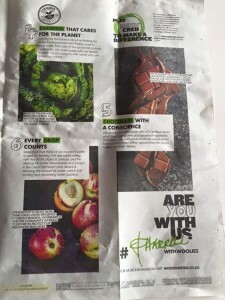 It claims to be the newspaper most focused in covering information about the environment! It highlights the importance of engaging with our planet ‘and ensure there is a viable, sustainable future for those who come after us’. It asks its readers: ‘What kind of planet would we like our grandchildren to inherit?‘ This questions linked to grandchildren rather than children puts a long term spin on the environment, rather than a here and now one! The Sunday Times admits its (and that of other ‘media organizations’) failure ‘to deal with these subjects with flair and imagination’. The article justifies its collaboration with Woolworths (the first mention of the retailer, halfway into the editorial, which one expects on the Editorial page and not on the front page). An editorial project, using #Pharrel Williams as the face of its campaign, was developed for each section of the newspaper, including the Lifestyle/Food section (has the Food Weekly gone under? ), the Business section, and the main body of the newspaper. It sounds as if the masthead change may become permanent, to demonstrate the newspaper’s environmental stance. 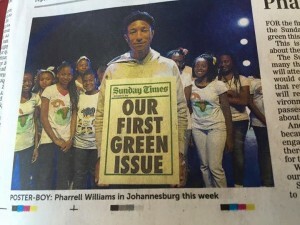 The newspaper also shared that it is now more focused on creating original content about the environment. 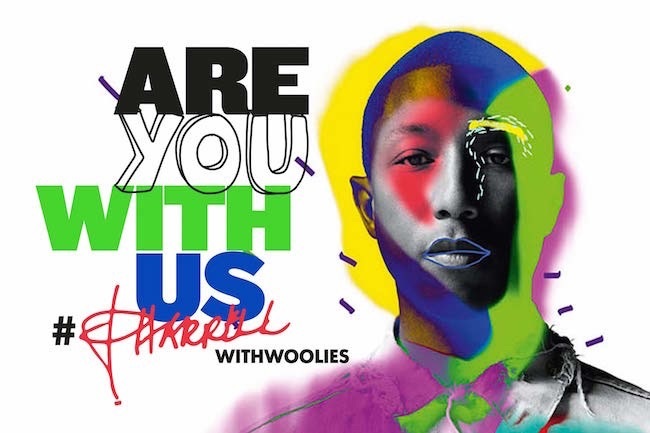 Woolworths CEO Ian Moir explains why Pharrell Williams is used in the global campaign for the retailer: ‘Pharrell is the global icon for social cohesion, advancement through education, and environmental awareness – these same values lie at the heart of the Woolworths business and forms the foundation on which this partnership is built‘. He adds that the retailer plans to raise R100 million for ‘schools in need’ (undefined as to which ones and which needs), and ‘to make sustainability cool for the next generation of South Africans‘, it not being explained whether these are the children or grandchildren. He adds that small changes can make a big difference, ‘because as Pharrell said, we only have one home, we need to look after it’. The article concludes with a statement by the Sunday Times that it will make the environment an ongoing topic of interest and concern! * ‘We believe doing good is good business‘, reiterating its focus on responsibility which ‘treads lightly on the planet‘, and stating that it began its environmental program eight years ago via its Good Business Journey. * ‘Taking Care of our Communities’, referring to having donated R590 million to a number of charities relating to food security and education. Every month the retailer donates R4,5 million to 8200 schools and charities. The balance of the R530 million donation per year is not explained! * ‘Caring about where our products come from‘, repeating itself by stating that it supports sustainable cocoa for use in its chocolates (as per their Food advertisement). It also shares that is the first local company to serve on the Round Table on Sustainable Palm Oil, and the Better Cotton Initiative. * ‘Making a difference with Earthcred‘, customers being invited to make a difference by ‘choosing food and fashion with a difference, every time you do, you can earn Earthcred‘. 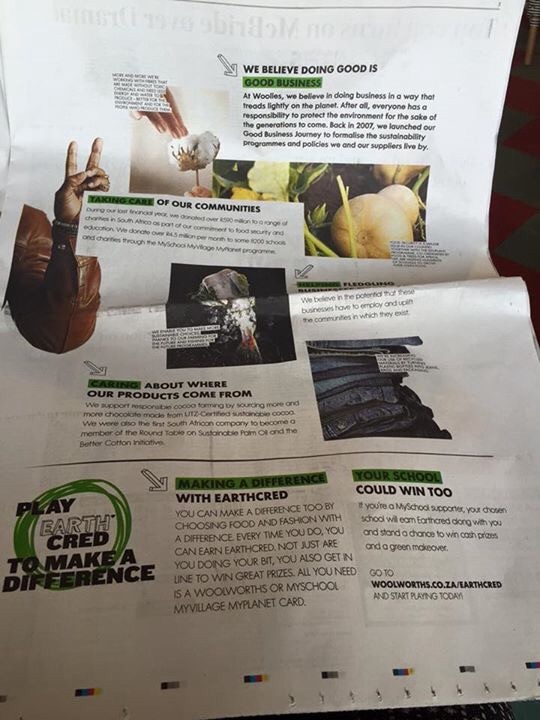 ‘Earthcred’ is not explained in the advertisement, but entices the customer with the possibility of winning ‘great prizes’, which are undefined! * Only sells ‘responsibly sourced fish’, working with SASSI, the Marine Stewardship Council, and the Aquaculture Stewardship Council, to make the source of the seafood products traceable back to the boat or farm it was sourced from. * Free range animals ‘are able to move around‘, and are not fed antibiotics to enhance their growth. * Only whole free range eggs are sold, from hens which roam outside by day, and roost indoors at night. By emphasizing that its whole eggs are free range must mean that other egg products used and sold by the retailer are not! * Food is grown ‘in harmony with nature and with tomorrow in mind‘, meaning that they focus on saving water, take care of the soil, and encourage Biodiversity. * Water is precious, and a joint project with WWF, Marks & Spencer, and the Alliance for Water Stewardship is investigating how fruit farming in the Ceres area can reduce water usage for fruit framing, and prevent water pollution. * Chocolate made with UTZ-certified Cocoa grown and harvested responsibly is sourced. This claim is interesting as the retailer sells commercial chocolates made in our country as well as in Switzerland, which will not have been made from such cocoa beans. Cynically one must ask which sum of advertising monies the Sunday Times will receive from Woolworths for it to dominate the newspaper?! 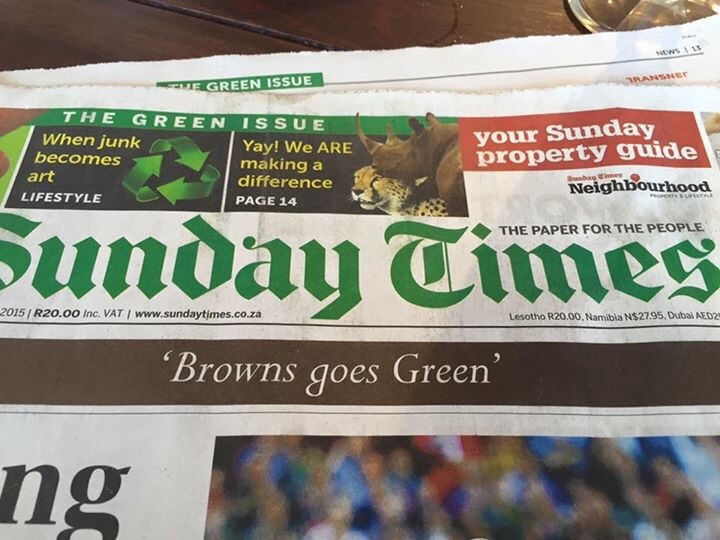 And why has it taken Woolworths and the Sunday Times so long to Go Green?! Miserable lives or all the GM products thrust on people stupid enough to still shop at Woolworths. As usual their marketing way exceeds the reality! Don’t fall for it! Weird is Woolworths’ spokesperson choices. First it was unknown Oz Hayden Aquinn, this year it is #Pharrel! Glad to report that most people I speak to have also stopped shopping at Woolworths because of their economy with the truth. I certainly am reducing my shopping there!